Indian School Girl Creates Washing Machine That Runs Without Electricity! We love these kind of inventions – Those that solve real world grass roots problem. Remya Jose, a 14 year school girl from Kerala, has created a simple pedal-powered washing machine which came about due to her dislike to wash clothes by hand. Her invention is not only a washing machine, but can double up as an exercise machine as well. This washing machine is actually quite simple. A modified bicycle frame attached to a square metal box that contains iron mesh drum inside. The pedal is basically like the exercise cycling machine with attached metal box extension. The Iron mesh drum hold the clothes, while the metal box holds the water with detergent mixed with it. Pedaling this machine for a few minutes moves the iron mesh drum inside, rigorously washing the clothes inside the drum. This entire cycle is carried out again for 1-2 times thereby cleaning the clothes thoroughly. After the complete water is drained, pedaling it few more minutes can dry the clothes to about 80 percent. The machine does need any electricity, doubles up as a exercise machine and it is quite affordable! It looks like the invention was first shown on discovery channel (the video has discovery logo on it) and was uploaded to Youtube by a user. This invention is similar to another one “Load carrier for labourer”, which was designed and created by a student from National Institute of Design and had won best product design award in 2011. What do you think of this pedal powered washing machine? 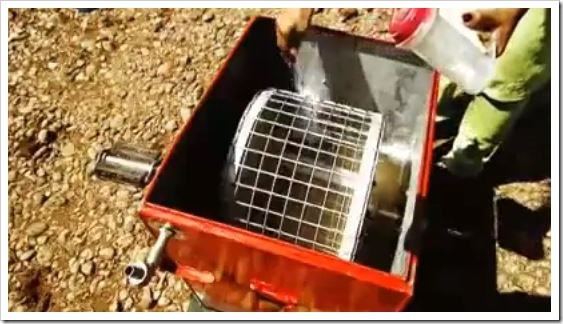 "Indian School Girl Creates Washing Machine That Runs Without Electricity! ", 5 out of 5 based on 1 ratings. 4 Tech Powered Crowdsourced Innovations That Will Stun You! We seen your invention and we want more detail on this washing machine as we want to purchase this washing machine from you for our home usage. So please make one washing machine for us and tell us its costing. Our address for correspondence is Husaini Akbarali Vakharia, Juni Darji Bazar, Nur Masjid Street, Rajkot, Gujarat. Our contact number is +91 9723268204/+91 8460265592. So please give us more information about this washing in detail, how much successful it is for washing cloths and are you interested in selling this washing machine. having all new features in it and within budget.i think it’s best product according to me. at home and its amazing. will not the water leak from the point where the padel and drum are joint?